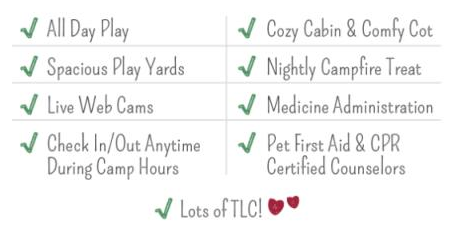 What Sets Camp Bow Wow Apart From Other Dog Boarding and Day Care Facilities? We’re happy to say — there’s no one thing that sets us apart. We became the number one name in pet care by completely revolutionizing the way dogs are cared for and boarded. With 150 locations, pet parents across the United States are never far from Camp. It’s this kind of national recognition and attention that has helped us become the number one name in pet care! Every pet parent should be able to enjoy their time at work or away on vacation without having to worry about what their pup is doing at home. More importantly, we think man’s best friend deserves a safe and fun place Where a Dog Can Be a Dog.® That’s why we make pricing affordable and easy to understand. Our love for dogs doesn’t start and end with our Campers — we want to make each an every dog’s life better. This was the idea that gave birth to our Bow Wow Buddies Foundation. This registered, 501(c)(3) organization is “dedicated to providing urgent medical care funds to dogs who are either homeless or whose parents cannot afford to pay their veterinary bills.” Last year alone, we granted over $150k to our fur-iends in need! Want to learn more about what it takes to succeed as a member of the Camp Bow Wow Pack? Fill out the form below or call us at 877-700-2275 to request a complimentary executive summaryand find out how you can mark your territory, today!